60° dump angle, 150° rotation. Vertical swing height of less than 10′. Discharges at 12″ above floor level. Chamferred box loading guides on skip for easy loading. Custom pallet jack portable base. Features MTS exclusive two-speed operation for reduced equipment cycle times. 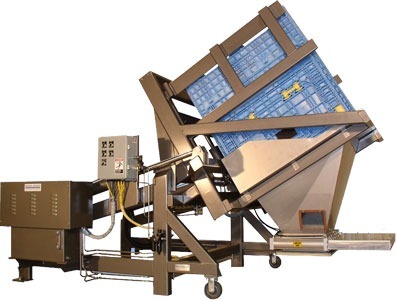 Lift & Seal System™ seals box to the pour hood to prevent product contamination. 304-2b stainless steel pour hood, with continuous TIG welds. Pour hood includes gasketed inspection door. Fully mounted 16″ square pneumatically actuated twin cylinder roller gate at discharge. Rigid stainless steel hydraulic lines are used where possible. 3″ diameter pivot shaft with piloted flange bearings. Hoffman NEMA 4 control enclosure with momentary contact controls. Allen-Bradley “Zero-Force” touch button for added operator safety. IFM Efector quick-disconnect proximity switches. Parker 5 GPM pumping unit driven by a 5 HP Baldor TEFC motor. Parker pumping unit provides smooth, quiet, and reliable operation. Power unit housed in an enclosure for easy cleaning.